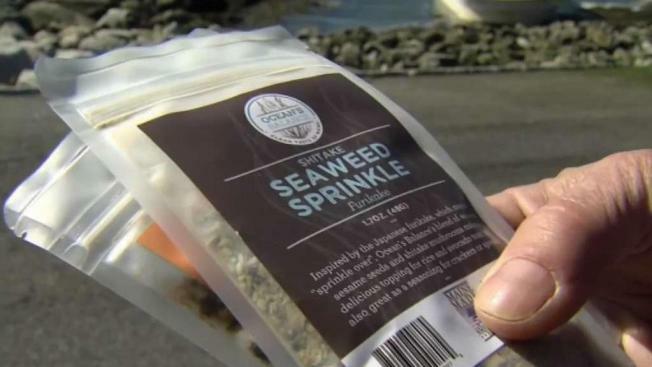 A Maine startup company that makes kelp puree and other seaweed edibles has won a $100,000 grant to expand the business. A Maine startup company that makes seaweed edibles and kelp puree has a lot more money to grow its business than it did just days ago. Over the weekend, Ocean's Balance, which has offices in Biddeford, and seaweed farms in Casco Bay, won $100,000 beating out dozens of other companies. One of Ocean Balance's founders, Tollef Olson, says the win is huge for a small business that has no full-time employees. "We're small enough that $100,000 is going to go a long way for us," said Olson. "We've been bootstrapping like nobody's business so this could not have come at a better time for us." Olson dove into seaweed in 2006 after holding various types of commercial fishing jobs. He wants to put the award towards hiring more staff, expanding seaweed farms and outsourcing package labeling work that's being done by hand right now. When asked what the long-term plan for his company is, Olson explained it's to make the Maine coast known for producing products from seaweed. Right now, the company sells its products to dozens of stores across New England and beyond. Olson hopes to branch into Whole Foods soon and says he's working on developing new product lines that will be easier to roll out with the new seed money.